...our itty bitty orangish table. We bought this guy off of Craiglist back in March, and it has always been slated for some sort of makeover. The water damage on the top had caused the finish to crack and buckle, and it was never really a color that we liked anyway. So last weekend I rolled it outside and got to work. First I sanded down the top with my electric sander. When I did this I saw that the water damage was even worse than I had realized. At that point I was a little worried that it was beyond repair, but I figured I could at least try. 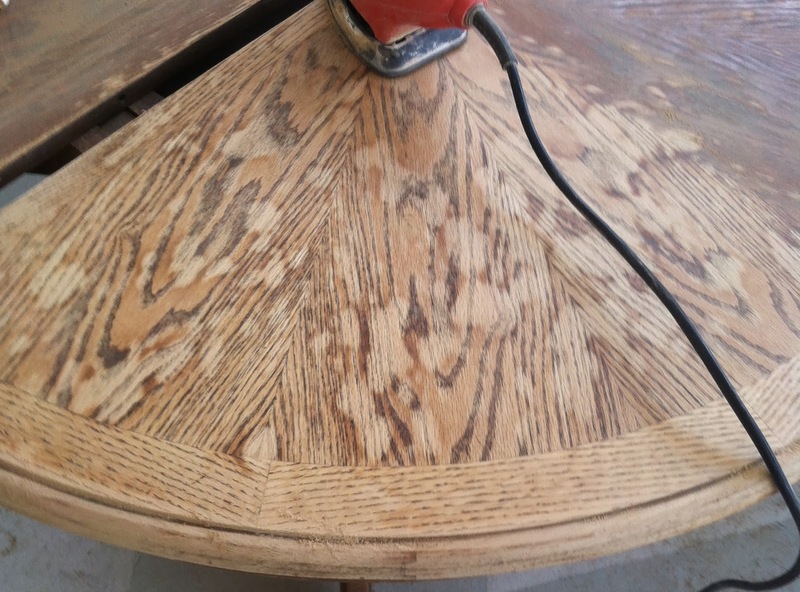 I took the top down until I couldn't see the water spots and then went over the whole thing with a very fine grain sandpaper. 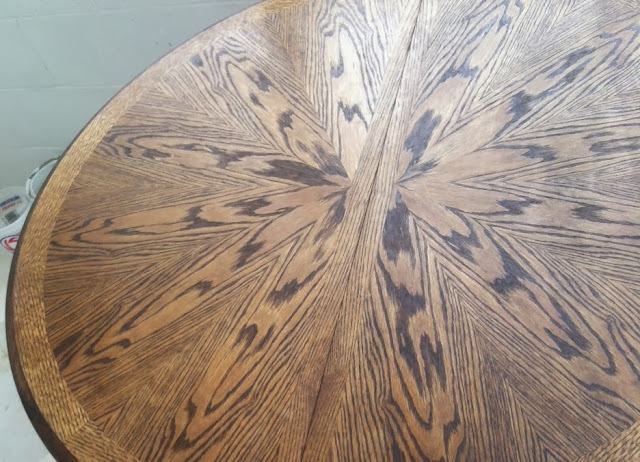 I decided to try to keep the pretty starburst pattern to the tabletop, so I used stain on only the top of the table. Waiting to wipe off the first coat was nervewracking - but worth it! Phew! I gave it one more coat of stain to darken it just a little bit more, and I was so happy to see that the water damage can't even be seen. 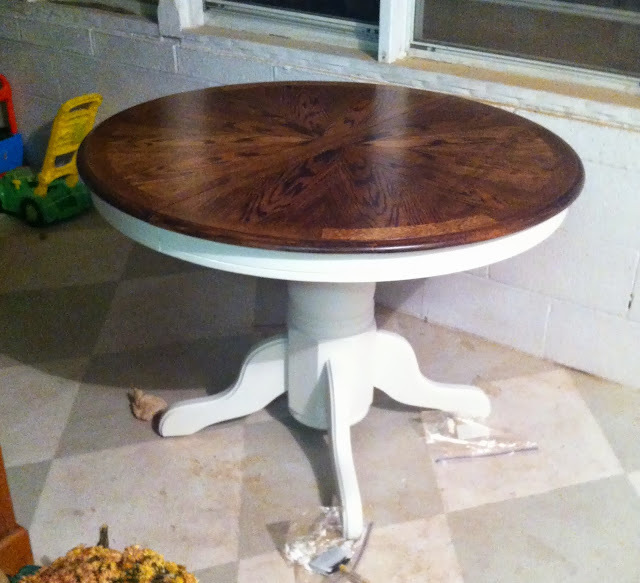 After 24 hours I did three coats of a satin finish polyurethane to protect the table from my little messy eaters! Now - on to the chalk paint! 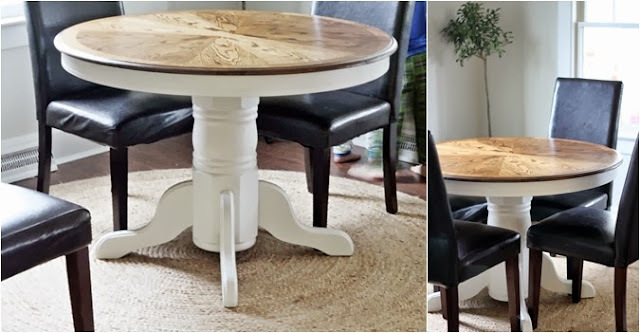 As I said, I followed a make-your-own recipe for this, which was 1/2 cup of warm water mixed with 1/2 plaster of paris, and then once that was fully mixed I added 1 1/2 cups of plain white paint (finish doesn't matter - so I used what I had on hand which happened to be semi-gloss. Because of the Plaster of Paris the finish will always be matte). After I mixed up my paint it was just a matter of patience. Remember - this is essentially watered down paint - so it goes on VERY thin. ...I finally had full coverage! 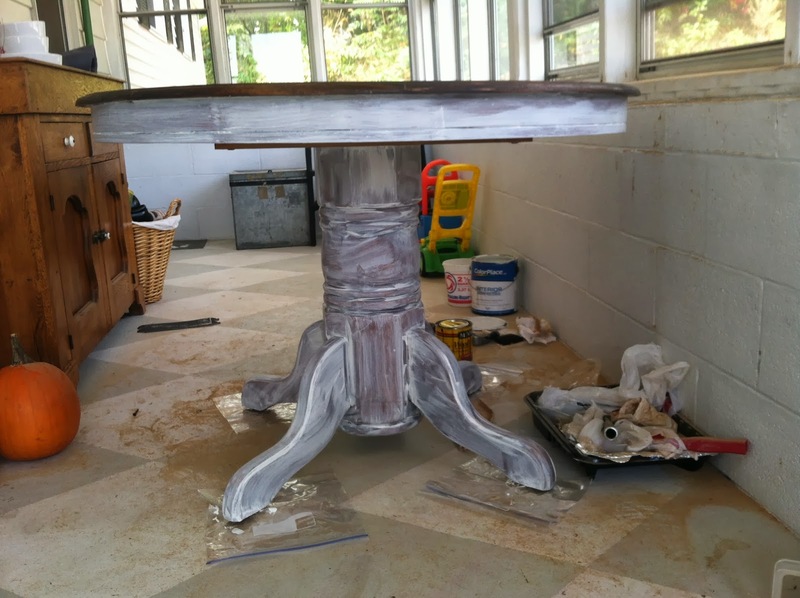 The last step is finishing the paint by using a finishing wax and rubbing it in to the whole thing. Go slowly and really work it in - it's worth the extra time it takes. We brought it inside. It might be the sort of thing that only we notice because we live here - but it really seems so much brighter without the solid dark base drawing your eye down. Plus we like the way the wood looks with our pretty new wall color. I realized after the fact that I forgot to refinish the leaf that extends the table - so I will need to do that before we have company over...which is almost never so that's probably fine! That was a fun one to check off of my list! Have you used chalk paint? What were your thoughts on it? This is so pretty! I love that you didn't paint the top and you're so right that it keeps the eyes higher. I'd totally never get around to painting the leaf, but that's what table cloths are for! very true! 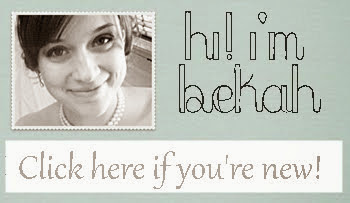 Plus I cant think of a single person that we would have over to dinner that would ve surprised to find me mid-project. Haha Ive been halfway through 3 things at once since I was a kid! I think it definitely makes the space seem brighter! I think it makes the table look larger too. Maybe because the white bottom doesn't blend into the chairs and the contrast gives it the look of being more spacious. Good point! When the kids get bigger we will definitely need to figure out a different table situation than our little guys - or it will be all elbows all the time! Haha at least it LOOKS bigger now though! Love it! And I really love the design on the top of your table so I'm glad you didn't paint that too.